“In the beginning was the Word, and the Word was with God, and the Word was God. He was in the beginning with God. All things were made through Him, and without Him nothing was made that was made. And the Word became flesh and dwelt among us, and we beheld His glory, the glory as of the only begotten of the Father, full of grace and truth.” John 1:1-3, 14. Some of the most beautiful passages in all of the Bible. Jesus, second person of the triune Godhead became one of us. God became flesh and dwelled (tabernacled) among us. That is something to meditate on and to grasp. Jesus, even before the foundation of the world already knew that He would become one of us and to voluntarily lay down His life for mankind. “He indeed was foreordained before the foundation of the world, but was manifest in these last times for you who through Him believe in God, who raised Him from the dead and gave Him glory, so that your faith and hope are in God.” 1Peter 1:20, 21. Jesus came despite the fact that He would be rejected by His people, He came into the world as prophesied long before by the prophets. He became the suffering servant spoken of in Isaiah 53. It blows my mind, thinking about Jesus becoming one of us, because God’s love for us is so big that He gave His only begotten Son. “For God so loved the world that He gave His only begotten Son, that whoever believes in Him should not perish but have everlasting life.” John 3:16. God in the flesh, who died for the sin of the world. He was full of grace mercy and love. He demonstrated the love of God on the cross at Calvary. His ministry lasted only about 3 1/2 years and He healed the many sick and forgave their sins. He showed love to everyone, without any partiality. Although He is God, at that time He humbled Himself. Paul put it this way: Let “this mind be in you which was also in Christ Jesus, who, being in the form of God, did not consider it robbery to be equal with God, but made Himself of no reputation, taking the form of a bondservant, and coming in the likeness of men. And being found in appearance as a man, He humbled Himself and became obedient to the point of death, even the death of the cross.” Phl 2:5-8. Jesus was in full obedience to the Father, fulfilling the plan of redemption for mankind. This humbleness is something to be behold and comprehend. Even the night before His death on the cross, Jesus was the servant. The disciple on many occasions, argued who would be the greatest among them. Jesus knew man’s heart and He gave the disciples an example that night, that they would never forget. “Jesus, knowing that the Father had given all things into His hands, and that He had come from God and was going to God, rose from supper and laid aside His garments, took a towel and girded Himself. After that, He poured water into a basin and began to wash the disciples’ feet, and to wipe them with the towel with which He was girded.” John 13:3-5. It was custom in the middle eastern culture to wash the feet of guest before entering the home. It was regarded however one of the lowest task. 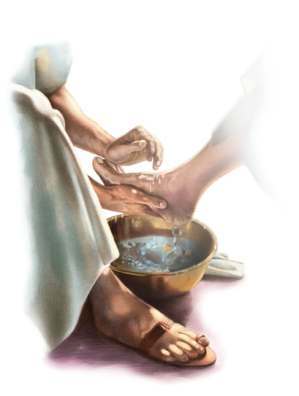 Here Jesus who is God in the flesh, stoops down and washes the feet of the disciples. I think they must have felt pretty bad, considering that they argued so many times about who’s being the greatest. Jesus was giving an illustration and He explained it to the disciples after Peter wanted no part of the washing, acting like he was so much more humble than the other disciples over there. “Peter said to Him, “You shall never wash my feet!” Jesus answered him, “If I do not wash you, you have no part with Me. Simon Peter said to Him, “Lord, not my feet only, but also my hands and my head!” Jesus said to him, “He who is bathed needs only to wash his feet, but is completely clean; and you are clean, but not all of you.” For He knew who would betray Him; therefore He said, “You are not all clean.” So when He had washed their feet, taken His garments, and sat down again, He said to them, “Do you know what I have done to you? “You call Me Teacher and Lord, and you say well, for so I am. “If I then, your Lord and Teacher, have washed your feet, you also ought to wash one another’s feet. “For I have given you an example, that you should do as I have done to you.” John 13:8-15. Jesus makes a point here, the believers in Him are already washed of their sins, being human however the believers will not be sinless in these earthly fleshly bodies. All of us who believe need our feet washed, the body is already clean but we walk in the filth of this world. If we do stumble or fall or step into some dirt, Jesus will wash our feet. and that by believing in you I will have eternal life and spend eternity with You. “Humble yourselves in the sight of the Lord, and He will lift you up.” James 4:10. “Therefore humble yourselves under the mighty hand of God, that He may exalt you in due time,..” 1Peter 5:6. “Come to Me, all you who labor and are heavy laden, and I will give you rest. “Take My yoke upon you and learn from Me, for I am gentle and lowly in heart, and you will find rest for your souls. “For My yoke is easy and My burden is light.” Mat 11:28-30. Amen to that. We are to be conformed more and more each day into the image of Christ. Humbleness is a virtue that has almost been lost in our society today. Even within the church it’s hard to find these days. I pray that The Lord will always be an example to me and others. He was the most humble person this world has ever seen. As long as I keep my eyes on Him and not man, I can only hope that I will learn from Him and not focus on myself. Humility – is so hard for people to understand or do in todays world. I know a little honest humbleness will go a long way in our Christian growth. For those who do not believe in the Holy Trinity the humbleness of Christ is even more important. Jesus also never claimed to be God and knew his position very well. Thank you Lyn, nice to hear from you. Wishing you a blessed new year. Awesome, and much NEEDED post, bro Freddy! God bless you and lot’s of love in Jesus Christ your way, and in all you do!